The most exciting and budget-friendly way to gain cultural insights would probably be roaming around the streets like a local and trying out local delicacies. In Kathmandu, every nook and corners of the streets are occupied with stalls grilling sekuwa, steaming momos, serving mouth wondering panipuri, dahipuri, and chaat, and the list goes on. Here are some of the most popular street foods in Kathmandu, which can be enjoyed from the comfort of your home, too, by ordering online from BHOJ, Nepal’s largest foodie app. Momos are arguably Nepal’s most popular local delicacy which can enjoyed by all ages. The jhol momo, in particular, stands out the most as the ‘jhol’ is the true hero of the dish. Jhol basically means liquid or having a liquid-like consistency, and jhol momos are momos that are drowned in a bowl full of sauce called jhol achar laced with powdered soya or sesame. The sauce or jhol achar is thin in texture and has a bit of a hot, spicy, and tangy twist. The jhol serves as the perfect accompaniment to the meaty goodness of the momo. This easy takeaway snack is a common street food in Kathmandu. The outer layer, which is made of flour, is usually crisp with a tantalizing filling of potato. Variations can be made to the stuffing by adding onion, ginger, peas, and chilis. 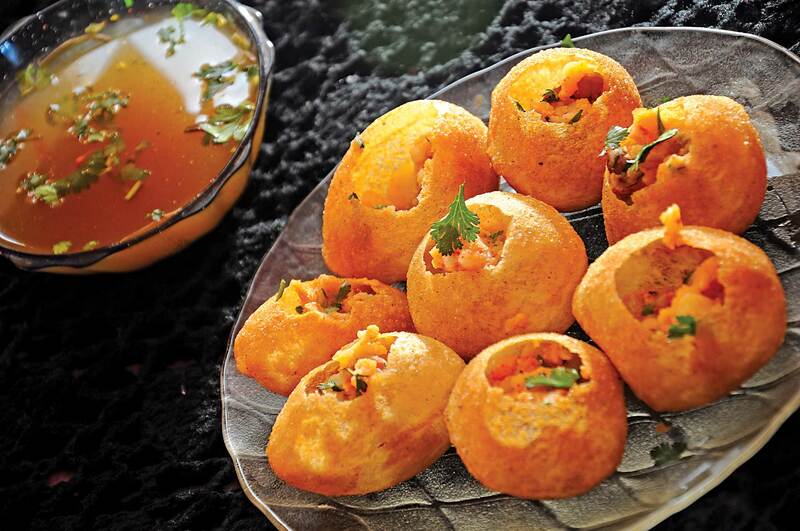 Usually served with chutneys, this is one delightful snack enjoyed by many. Panipuri is a concoction of crispy fried semolina balls, filled with seasoned mashed potatoes and lentils, and served with a tangy sauce. Chaat is a messy but delicious mix of potatoes, crisp fried bread, yogurt, chopped onions, chickpeas, and of course, a tangy sauce. Fulfilling and very budget-friendly, one can’t resist popping one after another. Other than these, one can also hog on the delicious dahipuris. This is another version of the same snack, a common street food in Kathmandu, where instead of spicy water, the puri is filled with curd. The Nepali-style barbecue, sekuwa, is a popular street dish. A growing trend in the Kathmandu street food scene, you will find at least one sekuwa stand in any vicinity. While the crowd favourite choice of meat is buff and mutton, you will find unconventional stands or thela serving luscious pork too. These charred proteins are smoked over burning coal and served in bite-size chunks along with the ubiquitous tomato achaar and red-chilli sauce. The unique mixture of special herbs plus different spices makes Nepali sekuwa extraordinary. Laphing is a cold noodle dish of Tibetan origin. This dish is a favorite among people who love super hot and spicy food. It is made with dough in soya sauce with ginger, garlic, salt, and pepper. The dough is rolled and cut in circles. You can get two types of laphing; plain laphing and soup laphing. There have been modern variations to laphing over the years, like colored ones and with interesting fillings like chips, sausages, and so on. Nepalis also enjoy a popular digestive chew prepared from green betel leaves, locally known as paan. The leaves are neatly rolled and folded into a triangular pouch that is filled with different combinations of ingredients, such as betel nuts, cardamom seeds, cloves, dried fruits, fennel seeds, and coconut chips. The combination is usually chewed slowly to refresh the palate. When habitually chewed, betel leaf stains the teeth and turns the mouth a deep red color. Betel leaf chewing is an acquired taste, and some people find it too strong at first try. Not just restaurants, get your favorite local delicacies delivered through BHOJ.